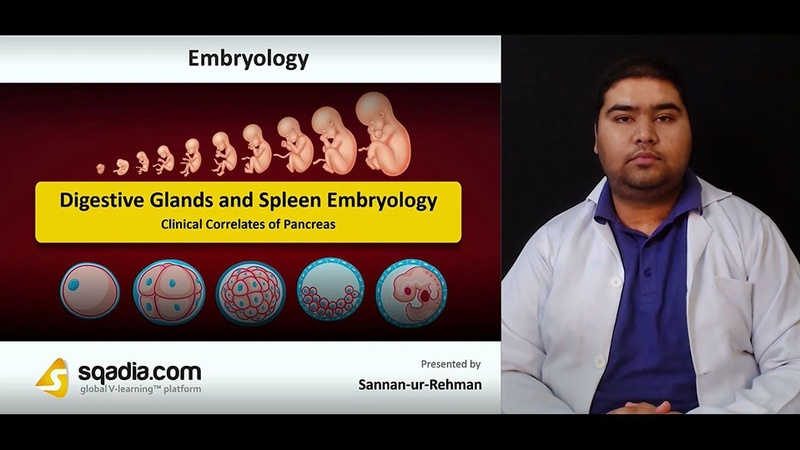 The following lecture deals with the explanation of Digestive Glands and Spleen Embryology. In section one of this lecture, the educator sheds light on Liver and Gallbladder. The Source of Development of Liver is elucidated followed by its Overview. Subsequently, the educator reveals significant details about Successive Stages of Liver Development. Later, Umbilical and Vitelline Veins are brought under consideration. The educator then discusses Histological Components of Developing Liver followed by a demonstration of Gallbladder and Extrahepatic Biliary Ducts. The prime focus of section two is Clinical Correlates of Liver and Gallbladder. The educator speaks extensively about Riedel’s Lobe and Polycystic Disease of Liver. Moreover, the Intrahepatic Biliary Atresia is described after which Caroli’s Disease is addressed. After mentioning some Other Clinical Correlates of Liver, the educator shifts discussion towards Clinical Correlates of Gallbladder which include Agenesis of Gallbladder, Absence of Cystic Duct, Anomalies of Shape, and Anomalies of Extrahepatic Biliary Ducts. Section three is dedicated to cover all aspects of the organ Pancreas. The educator highlights Development of Pancreas and its Dorsal and Ventral Buds. Later, the Development of Pancreas and its Ducts is thoroughly elucidated followed by a more specific and extensive discussion on Development of Ducts of Pancreas. At the end of this section, the educator talks in detail about Histogenesis of Pancreas. Section four is about Clinical Correlates of Pancreas. First of all, Annular Pancreas is thoroughly reported. The educator then brings to light Divided Pancreas and talks extensively about Accessory (ectopic) Pancreatic Tissue. Apart from this, the Inversion of Pancreatic Ducts is comprehensively introduced. Section five mainly focuses on Development of Spleen. An overview of Development of Spleen is presented followed by an elucidation of Spleniculi. Moreover, the educator imparts extensive information about Dorsal Mesogastrium and Histogenesis of Spleen. Subsequently, Accessory Spleen is brought under consideration followed by an elaboration on Lobulated Spleen.